At first glance, remastering 2002’s Warcraft III seems like a fairly straightforward task. Take the ugly bits and make them pretty. Overhaul the cutscenes. Give all the muddy terrain and building textures a 2018 makeover. Redo Arthas’ weird face. For Blizzard’s classics team, though, that’s just the beginning. Warcraft III, after all, opened the door to World of Warcraft. Back in 2002, Blizzard had no idea what kind of behemoth its then-unreleased MMO would become. The 2002 RTS set countless World of Warcraft stories into motion, from Arthas’ defection to the dark side, to Thrall’s increasingly convoluted hero’s journey, to Illidan’s eventual coronation as king of the edgelords. 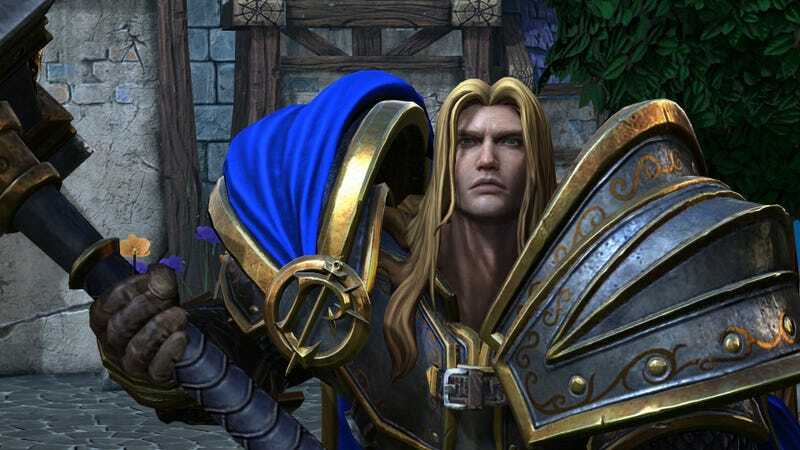 As a result, Blizzard’s classics team doesn’t just want to give Warcraft III a visual overhaul. They want to bring a classic in line with what came after. This starts with locations. During an interview at BlizzCon, executive producer Chris Sigaty and QA lead Nicholas Louie showed me the map of beloved level “The Culling,” where then-hero Arthas’ kicked off a heel turn that would eventually see him transform into a World of Warcraft mega-villain. Just like back in 2002, the level tasks the player—as Arthas—with purging a human city full of undead-plague-stricken citizens. However, that city, Stratholme, went on to serve as the backdrop for two dungeons in World of Warcraft, so its layout in Reforged has been altered to mirror its later WoW incarnations. Sure enough, just playing the BlizzCon demo, people noticed appearances by bosses from the World of Warcraft: Wrath of the Lich King “Culling of Stratholme” dungeon, in which players travel back in time and help Arthas do his dirty deed. The development team is still figuring out exactly which locations will get WoW-ified, but Stratholme definitely won’t be the only one. Warcraft III also introduced characters who’d eventually become movers and shakers in Warcraft lore after players, er, killed everybody else, but at the time, those heroes and villains’ personalities and motivations were only given thin outlines. That, too, is going to change in Reforged. Again, the team is still ironing out specifics of how exactly they’ll do this, but Louie said dialogue and cutscene alterations are definitely on the table. Of course, the potential problem with all this is that those characters and locations weren’t important by design. Warcraft III wasn’t just a vehicle to ferry players into World of Warcraft, and peppering it with winks, easter eggs, and outright rewrites—especially involving material that wasn’t conceived until years later—could turn it into something it was never meant to be. Blizzard’s classics team, though, includes multiple members of the original Warcraft III development team, and Louie said they’re doing their best to avoid knocking this holy grail off the pedestal players erected for it in their memories. Make no mistake, though: the bulk of Reforged’s DNA is still Warcraft III. Sigaty described the classics team as “lucky” to have access to all of Warcraft III’s original code and assets, as Warcraft III marked the first time that Blizzard really made a concerted effort to preserve a game while creating it. That wasn’t always the case. So Blizzard is looking forward while glancing back, but where is all of this headed? Longtime Warcraft fans, of course, are hoping beyond hope for the same thing they always do: a new real-time strategy game, Warcraft IV. And while Blizzard says it doesn’t have anything currently in the works, Sigaty gave me the most encouraging answer I’ve heard in all my years of attending BlizzCon and asking this same question literally every time.